I haven't posted anything about innovation in the last week or so because I've been busy making my way through the wonderful pages of Prophet of Innovation: Joseph Schumpeter and Creative Destruction. 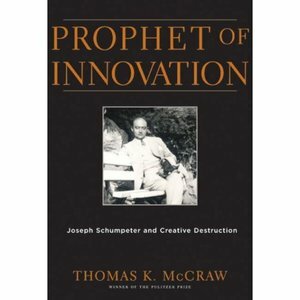 Penned by Harvard Business School's Thomas K. McCraw, Prophet of Innovation is an entrancing look at Schumpeter's life and work. I'm less than a third of the way though its 736 pages, and I've already learned a great deal about this subject innovation which is so dear to my heart. It's Schumpeter who lent shape to many of the ideas, constructs -- even a worldview -- which inform life here in Silicon Valley, as well as in any economic system where advancement is valued more than stability. I've been hearing from a lot of folks that this "innovation thing" has peaked. As a fad, perhaps. But as a way of seeing the world, let alone a pragmatic way to improve the quality of life on this planet, innovation is much more than just the hottest management trend. What Schumpeter saw 90-odd years ago is still in force today, and though context may change, I believe he uncovered some basic truths about the way that macro and micro economic policies can create a fertile field for innovative behavior to flourish. Thanks for the tip! I'm adding it to my wishlist.